Perhaps to help us with our quest for a long term rental, perhaps I can ask people here why they chose where they live now? Do you like where you live? What do you like and what don't you like? 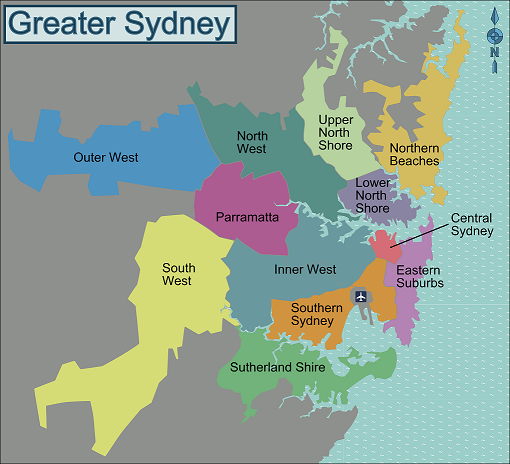 Where else would you live in Sydney area if you didn't live there. Value for money. We had a few areas in mind but, in the end, after looking around in Sydney's Inner West, we decided that we got more for our dollar in the Hills. For what we paid for where we live now, we would have got a pretty run down place in the inner west that would have needed at least $100,000 more spent on it to make it habitable. First on the list for us was a sensible commute, I work (mostly) in Chatswood, St Leonards or North Sydney so wanted to be on the north side, and also wanted to get back to bike commuting so was looking for somewhere within 15km or so of those places. If it were up to me and commuting was no object, I'd like to be more urban, or on the beaches, or maybe both if I was made of money. I am a city boy and love the sea. However it's not just up to me, commuting is an object, my wife likes the space and privacy of the suburbs and as a redhead has very little interest in beach-related activities. If money wasn't one of my concerns, I would probably go for Willoughby or Lane Cove. But to get the sort of place I would want would mean spending around $2 million. The inner west is another possibility - maybe Stanmore or Wareemba or Abbotsford, but then you're looking at the same sort of money or even more, which is why we settled on The Hills - plent of nice properties around the $1million mark, and not much to spend on them - and only a 40 minute bus trip to the city. I live in Surry Hills, or sometimes I say Strawberry Hills, which is a suburb within a suburb, kept alive only by its post office and a pub. Surry Hills is in the inner city, so close to Sydney, that I sometimes just say that I live in the City, and it is the closeness to everything that is its main drawcard. Central station is five minutes walk, with buses outside my door. I can walk to UTS, Sydney Tech, the ABC,and China Town in 10 - 15 minutes, and not much more to Town Hall. Cafes, pubs, restaurants, shops are all around, literally hundreds within 10-15 minutes walk. Lack of space for a garden, especially if you have kids, is probably the main drawback, and most of the homes are either 19 century terrace homes, or more modern blocks of flats. I don't think there would be a single suburban house or bungalow in Surry Hills. That does not mean it is unpopular with families, and many like being able to walk to school, rather than drive, and make use of parks to make up for the lack of gardens. One of my friends was here today, and we had breakfast in a cafe right outside my flat. She lives in St Ives, and whilst she brought her kids up in the 'burbs, now, as a single person she finds the suburbs a little stifling. They are great when you are bringing up kids and you can make your life around your home, but not so much fun when you are on your own, and the nearest cafes/pubs etc are all outside easy walking distance. Finding a place to live also depends on where you are going to be working, because Sydney is not a pleasant place to commute long distances to work, and the weekend traffic is often worse than during the weekly peak. The most affordable homes are in the far-flung suburbs, around Campbelltown, Penrith, and also north, south and further west of Sydney, on the Central Coast, Illawarra, and Blue Mountains. Many people spend an hour or more commuting each way. I work at Penrith, which is between 50 and 70 minutes by train depending on which service I use. I live and work close to the station but I still have to allow ten minutes either side of the train journey, so I am spending 90 minutes each way commuting. So, if you can both find a place, and afford a place, close to where you are going to be working, that is what I would recommend! I understand, but in a way there are two PIO's for me, the one with the ratbags (including me!) and I can't help getting into futile 'yes it is, no it isn't' arguments, and then there is the one where I feel like I'm doing a bit of good, both for me and for the people asking questions. I'm off work at the moment recovering from my hernia, so spending a couple of hours on here gives me something to do, though I should be trying to write something for myself. Thought I'd drop back in and say we are now settled in Leonay, about 10 mins from Penrith on the Nepean River. Choosing a suburb in Sydney Is hard as hell. So many variables. We have some loose ideas and 6 months before we land. If we didn't have kids in school or might be easier as we could find out through trial and error. But as we don't have that luxury it's hard! So it's a case of nailing a decent compromise. Thanks @northshorepom - very helpful. We find loads of places that seem good, except for high schools, and we also struggle to understand the school 'ratings'. We can try for a selective high school, but that is far from guaranteed. The better government non-selective high schools are dotted around the city. Many decent ones in the shire, some on the north shore (Killarney heights) and some in the inner west or west of there (west of Balmain etc). I am not entirely convinced by league tables and reports for schools here in the UK to be honest. They only show part of the story. We prefer to try and understand from recommendation and word of mouth. I think this might also apply to Sydney. Except there are more private and church schools. I'm sure we'll work something out though. It's just hard to tell from the schools websites and those bettereducation results. My brother lived in Picnic Point for over twenty years, and I've grown to rather like the area too. Revesby, Panania, Padstow, all have good shopping centres and railway stations, with the train to the City taking about 35 minutes I think. You can drive to Cronulla in about half an hour I think, via Menai and Sutherland, for a swim. There are nice homes around Menai, Alfords Point, Bangor, although there is no rail service.